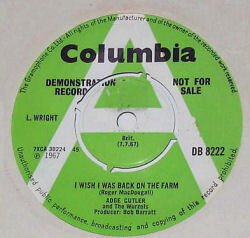 I Wish I Was Back On The Farm was the third single release by Adge Cutler & The Wurzels - and was the first track released (on single or album) not written by Adge himself. The song was originally sung by George Formby in his 1940 film Spare A Copper, and one can imagine that there was some pressure on Adge from the record company to record a more commercially acceptable cover version in an attempt the reach a wider audience. 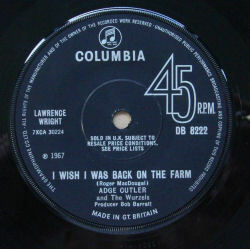 Whoever's idea it was, it didn't work, and I Wish I Was Back On The Farm never charted. 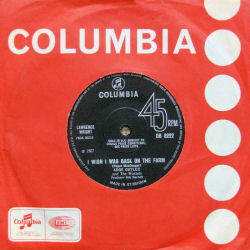 The track was also not included on the Adge Cutler's Family Album (it was not unusual for singles to be released independently to albums in those days) - although it have appeared on several compilations since and has become a popular back catalogue number with fans. 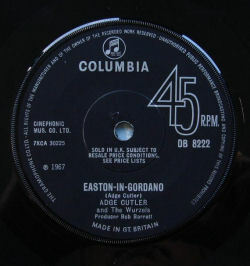 The b-side, Easton-In-Gordano, did appear on Adge's second album, and remains a fan's favourite.